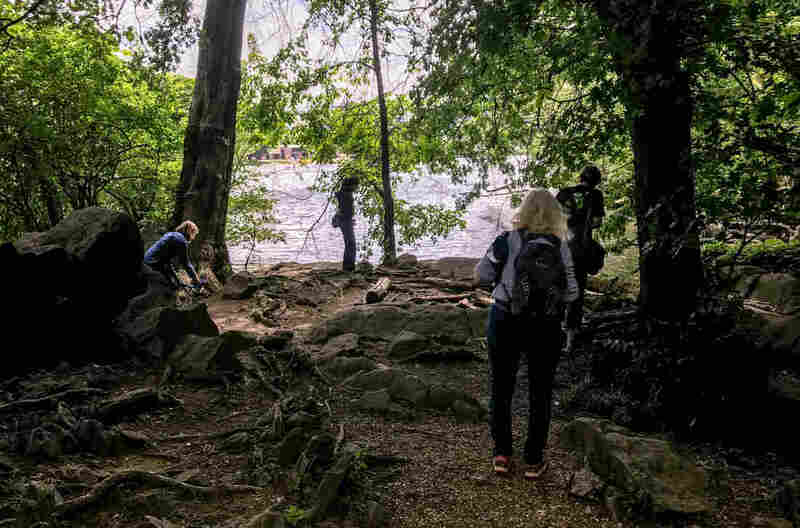 Forest Bathing Melds Nature With Mindfulness To Improve Health : Shots - Health News If hiking is about a destination, forest bathing is about an immersion of the senses into the natural world. It's a wellness trend, and studies suggest several health benefits. Clare Kelley practices "forest bathing" along the edge of an urban forest on Roosevelt Island, in the middle of the Potomac River. In contrast to hiking, forest bathing is less directed, melding mindfulness and nature immersion to improve health. When my editors asked me to report on forest bathing, I packed a swimsuit. I assumed it must involve a dip in the water. It turns out, my interpretation was too literal. 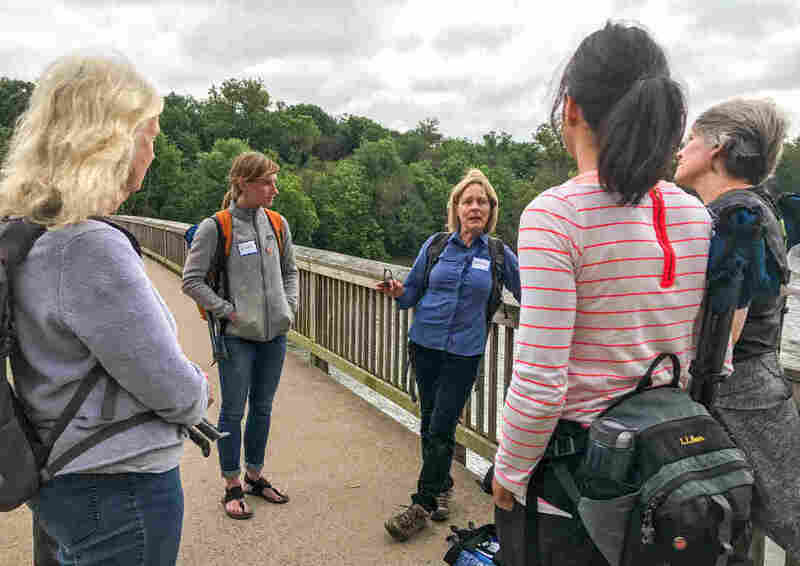 I met certified Forest Therapy guide Melanie Choukas-Bradley and several other women who'd come along for the adventure at the footbridge to Theodore Roosevelt Island, a dense jungle of an urban forest along the Potomac River in Washington, D.C. Here, I began to get it. Forest bathing isn't a bath. We sat on the banks of the river, but we did not get in the water. It's not a hike, either. We did walk the forest trails, but we meandered with no particular destination in mind. Melanie Chouckas-Bradley leads a group of five women in a forest bathing excursion. She is certified as a forest therapy guide through the Association of Nature & Forest Therapy. As we passed through a stand of pawpaw trees, we touched the bark. We smelled the black walnuts, which give off a lovely citrus fragrance. We got a little shower of ripe mulberries, too. "Close your eyes and just breathe, just breathe," Choukas-Bradley intoned. It felt a bit like a meditation retreat. It took me a few minutes to clear out the clutter in my brain, and tune in to the natural world. "When you open your eyes, imagine you're seeing the world for the very first time," Choukas-Bradley told us. Melanie Choukas-Bradley reads some nature-inspired poetry and quotes from renowned naturalist John Muir, as part of the walk. "The air is as delicious to the lungs as nectar to the tongue," Muir wrote. "That could describe our day here now," Choukas-Bradley says. After I opened my eyes, the green looked a lot greener. And I began to see things I hadn't noticed before: the flutter of birds, the ripple of the water, the swaying of trees. 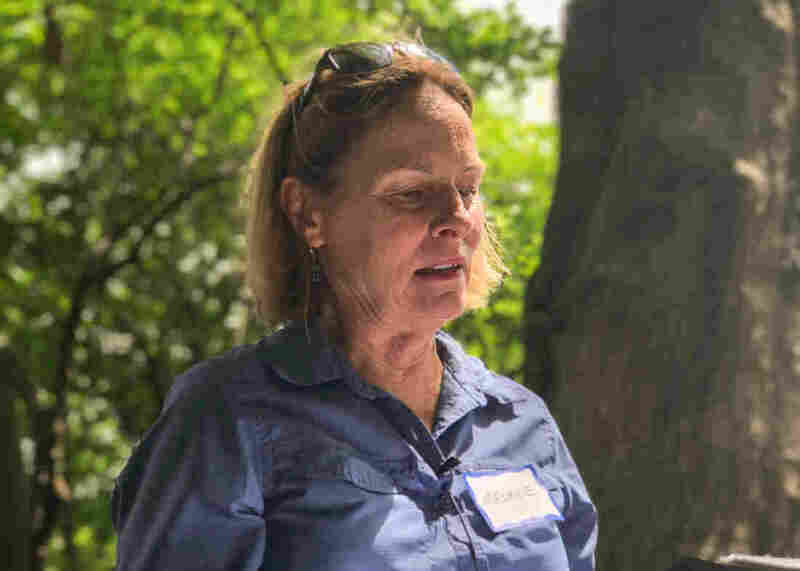 A forest guide "helps you be here, not there," says Amos Clifford, a former wilderness guide with a master's degree in counseling, and the founder of the Association of Nature & Forest Therapy, the organization that certifies the guides. Clifford's goal is to encourage health care providers to incorporate forest therapy as a stress-reduction strategy. There's no question that stress takes a terrible toll in the United States; a 2015 study found work-related stress accounts for up to $190 billion in health care costs each. "It's my hope that the health care system will include [forest therapy] into the range of services they reimburse for," Clifford says. The practice began in Japan. Back in the early 1990s the Japanese Ministry of Agriculture, Forestry and Fisheries coined the term Shinrin-yoku — which translates roughly as forest bathing. Now, forest bathing is starting to take off in the U.S. The Associations of Nature & Forest Therapy plans to train and certify about 250 new guides next year. "We're aiming to have 1,000 trained guides within three years," Clifford says. There's a growing body of evidence that the practice can help boost immunity and mood and help reduce stress. "Medical researchers in Japan have studied forest bathing and have demonstrated several benefits to our health," says Philip Barr, a physician who specializes in integrative medicine at Duke University. One study published in 2011 compared the effects of walking in the city to taking a forest walk. Both activities required the same amount of physical activity, but researchers found that the forest environment led to more significant reductions in blood pressure and certain stress hormones. On average, the forest walkers — who ranged in age from 36 to 77 — saw a reduction in their systolic blood pressure from 141 mmHg down to 134 mmHg after four hours in the forest. This might not sound like a big difference, but it can be clinically significant. Most doctors these days agree that people younger than 60 should aim to keep their blood pressure under 140. "I'm very impressed with the primary research done in Japan," Barr says. He thinks many patients could benefit from forest bathing, especially those who are under stress. "Forest bathing could be considered a form of medicine," Barr says. "And the benefits of nature can be accessed so simply." It's not a big surprise that researchers were able to document a decrease in blood pressure among forest bathers. As people begin to relax, parasympathetic nerve activity increases — which can lead to a drop in blood pressure. There's another factor that might help explain the decline in blood pressure: Trees release compounds into the forest air that some researchers think could be beneficial for people. Some of the compounds are very distinctive, such as the scent of cedar. Back in 2009, Japanese scientists published a small study that found inhaling these tree-derived compounds — known as phytoncides — reduced concentrations of stress hormones in men and women and enhanced the activity of white-blood cells known as natural killer cells . Another study found inhalation of cedar wood oils led to a small reduction in blood pressure. These are preliminary studies, but scientists speculate that the exposure to these tree compounds might enhance the other benefits of the forest. The idea that spending time in nature is good for our health is not new. Most of human evolutionary history was spent in environments that lack buildings and walls. Our bodies have adapted to living in the natural world. But today most of us spend much of our life indoors, or at least tethered to devices. Perhaps the new forest bathing trend is a recognition that many of us need a little nudge to get back out there. The practice of retreating to nature to find stillness and calm is age-old. In his essay Walking, Henry David Thoreau wrote, "I think that I cannot preserve my health and spirits, unless I spend four hours a day at least — and it is commonly more than that — sauntering through the woods and over the hills and fields, absolutely free from all worldly engagements. "